In the surface and if your analysis is a result of reading the last few weeks’ tabloids outside Sweden, the outcome of the Swedish general elections was a drama and a shock with the antiestablishment anti-immigration definitely xenophobic and far-right party of the Sweden Democrats be the winner. Titles like: “Neo-Nazi Rooted Party Claims ‘Kingmaker’ Status”, “Sweden Shifts to the Right” and “A nation divided” dominated headlines while Le Pen celebrated the victory of the “northern ally”. Summarising, the Red-Green alliance (SDP – Left – Green) that was government under Stefan Löfven till now, got a 40.6%. The conservative alliance (Moderates – Centre – Christian Democrats – Liberals) got 40.3% and Sweden Democrats a 17.6%. The turn out in 2014, was: 6,290,016 (85.8%) while in 2018 it was: 7,495,927 (84.4). So, now let’s get to the numbers. After four years it is natural that the minority red/green government faces a kind of backlash and only governments under extraordinary circumstances don’t deal with that. However, it is obvious that a big part of the loses for the Social Democrats and the Green party gone to the Left alliance and a smaller part to the centre party. The same looks to have happened with part of the Moderates loses with votes having leaked to Liberals and Christian Democrats. Even in real numbers of votes, the thought remains the same. The same time the increase 4.7% of the Swedish Democrats voters while partly might come from loses from the other parties the most possible scenario seems to be that they are coming from people who hadn’t vote the last time and decided to do so this time. Between 2014 and 2018, there are 1,205,911 more votes and the number is definitely not new voters only. It looks a bit simplistic in the surface but it is the same time an answer for the SD’s increase of power. The Sweden Democrats managed to motivate people to the polls, people that perhaps didn’t vote in the last election. Somehow their strong anti-immigration campaign motivated 300,000 voters to give them this extra 4.7% and yes they could be included in the 1.2m difference of new voters between 2014 and 2018. It actually makes perfect sense. It is also a reminder to something we have seen before in the European electoral history. Earlier I mentioned France’s National Rally (former National Front) leader, Marine Le Pen. Marine just like Jimmie Åkesson, the leader of the Sweden Democrats, grew up inside the party, for different reasons though. Marine much earlier than Jimmie realized that the party had reached its limits and if she wanted to go any further from the opposition she should change, modernize, even adapt in a new world that is partly multicultural. And she did so first expelling anything that reminded the fascist past including eventually changing the name and then pushing her own father, Jean-Marie Le Pen and founder of the party out excluding him from any decision taking and influence. Marine Le Pen went as far to welcome immigrants in the lists of her party candidates creating a new blueprint for modern far-right parties in Europe. In 2017 everybody thought that she had a real chance for the French presidency when she finished behind Macron in the first round of the presidential elections rising hopes for the presidency that died a week later when she managed to get the 46% of the votes. During this last year since the elections, the National Rally shows constant decline in every survey due to old habits surfacing after the presidential defeat and people start seeing again beyond the “modern” veil with which Marine tried to cover the fascist National Front. In 2017, the French far-right reached its peak and it was the period boats full of refugees from Syria were arriving all around Mediterranean causing series of problems, including real logistic problems to unprepared states, inspiring the message of fear Le Pen was preaching. 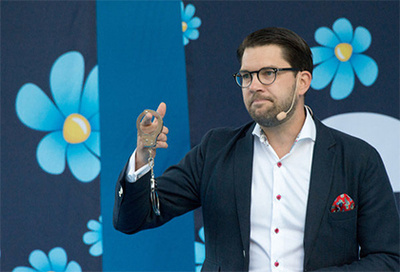 The road to the 2018 general elections in Sweden was similar for Jimmie Åkesson and Sweden Democrats. The party has its roots in the Swedish white nationalist and Nazis movements and in its modern form was inspired from the fascist British National Front including the design of its logo. Following Le Pen’s blueprint, the SD has rejected its past to the point to exclude members that expressed fascist, Nazi or supremacist ideas. Just like in Le Pen’s case, immigration was the motive but here comes another element that’s worth to notice. Violence. Coincidentally the first five months of 2018 a lot of acts of violence have exploded mainly in the South Sweden where a big part of the population is immigrants or foreign born Swedes. Burning cars and gang fights, rapes, vandalisms, harassments and robberies have become a daily issue all including immigrants and refugees while equally coincidently this area is SD’s stronghold and the place they collected most votes. Too many coincidences falling together and this is not a conspiracy theory. My opinion is that just like with Le Pen in France and if nothing extremely radical happens, the Swede Democrats reached their peak into the Swedish society and after building so much anticipation the last few months for a party that will form the next government, they are going soon to feel the downfall of the lost expectations and just like in Le Pen’s case that will pull away the “modern” conservative/nationalist veil and leave the real fascist face in plain sight. Fascist and Nazis were always around and there are many reasons for that including the fact that a lot of political parties loved to use them either as the boogieman or as the hands and faces for their dirty works. What has happened the last two decades is that all these fascist elements have surfaced; they took off the masks, feeling that they don’t needing the cover anymore. Consequently now we know …their faces and their names. We also know who’s collaborating with them and that’s also good in a very twisting way. Still, nothing of that means that we shouldn’t fight them and exclude them from our societies without limiting ourselves to the obvious with the Nazi tattoos and the Nazi salutes but also to the behaviour. Europe faces Nazism and fascism beyond Le Pen, Michaloliakos and the Nazi Golden Dawn in Greece or Hala Aho with the True/Pure Finns and Åkesson. Europe faces real fascist and authoritarian internal threats, the Hungarian Prom Minister Viktor Orban to name one; the Czech and the Polish governments, elements in the Italian government and while EU feels uneasy with the Sweden Democrats they do absolutely nothing with Urban, on the contrary they welcome him and give him the right to influence with his fascism Europe’s future and identity. As for Sweden, the Swedish democracy is exactly in the same place she was four years ago with the 82.4% of the population opposing and fight the Nazi party.